The more analytics I see, the more puzzled I am by the disparity among them. In this particular case, the huge difference between Posterous stats and Google Analytics after just one month of publishing. 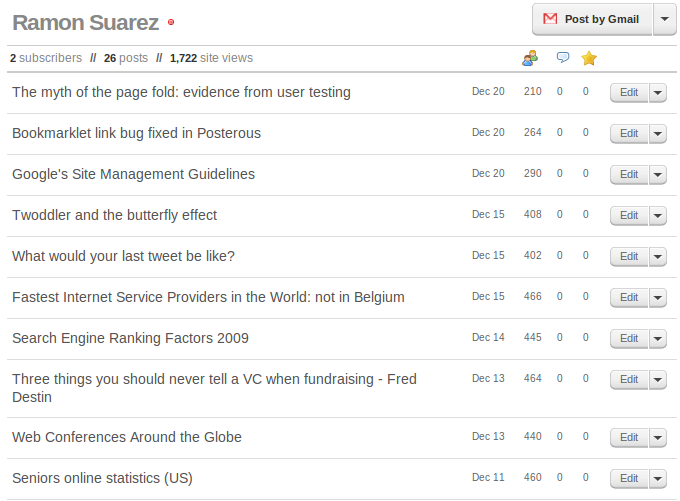 According to Posterous, this blog has already received 1722 visits. But according to Google Analytics, it has received 294 with 499 page views, of which 222 are unique visitors. I guess that what Posterous counts are pageviews, but still the difference is way too big among them. I never really found posterous stats to be accurate. Neither do I. What do you think they represent? Looking at the numbers I guess that every time the homepage loads it ads one to all the posts shown within that page.Still, I would like to know what they represent exactly. Thanks a lot Gil. That’s the kind of insightful advice I was looking for. I have found the same discrepancy and under reporting of Google analytics even when comparing the same site with Urchin (which is also a Google product and the base from which Google Analytics was built.) Like any other statistics, the evolution of site analytics is what matters, more than the absolute numbers. blueclock??? thanks for that reply. Makes a little more sense now. Benjamin, good find. Thanks for posting that link. Thank you all – the statistics piece – I definitely ran into shortly after making posterous my platform of choice for blogging. Good to know there was an answer for this question! You can also try <a href=’http://www.estimix.com’>www.estimix.com</a> ??? a free tool that provides a nice summary of the website performance.The estimation provided by estimix is the result of a complex analysis based on factors like: the age of the website, the demographic structure of the traffic, the countries where the website is popular and sources of the traffic. Thanks for this post and for the comments – it’s very interesting. My own opinion is that I wouldn’t view one web analytics tool as more *accurate* than another — they are all severely flawed. Rather than getting absolute data from any system, what you really want to see are trends and correlations. The numbers will always be flawed. For example, one huge flaw in Google Analytics is that they record time on a page by subtracting the time spent on the first page from the time spent on the 2nd page. But if a visitor only visits one page, you can’t do the subtraction, so it looks like they just stayed for a split second, even if they were there for 30 minutes.So I wouldn’t get too hung up on absolute accuracy, because what you are really interested in is a tool that can isolate variables, show trends, and help you see things from multiple angles. Nice Post. Excellent Information. Thanks for sharing the information. Keep it UP. and once again thank you. From the Posterous.com website. I’m still a little unsure of what they mean. I think the numbers still don’t add up.How are site and post views calculated?There are many things that trigger a "view" for a post and a site: viewing the blog triggers a view for all posts visible on that page. In addition, a view will be triggered by the blog post page itself, the RSS feed, and http://posterous.com/explore. View counts are updated every five minutes. Google Analytics is better at measuring visitors and filtering out impressions triggered by search engine bots, crawlers, or indexers. You can set up Google Analytics for your Posterous by following these instructions. This thread has explained a lot of things to me, that I have wondered about. Thanks.